It is fig season again! 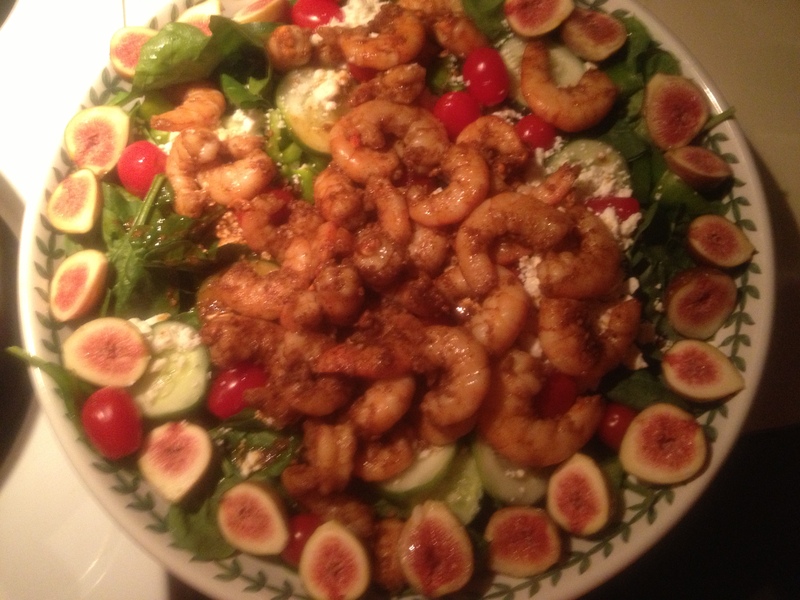 Made this lovely salad the other night – blackened shrimp, spinach, bell pepper, cucumber, tomato, feta and yes…FIGS! I had some asparagus in the fridge I really needed to use but it was way more than I could eat in a traditional way. Having been up to my ears in basil lately, I have been making a lot of pesto so I thought I could use asparagus in the same way. I cut about 2 cups of asparagus stalks in to two-inch pieces (discard the very bottom of the asparagus). Boil asparagus until tender (time will vary depending on the thickness of the asparagus); Drain asparagus and put stalks into the food processor; add a heaping tablespoon of minced garlic, and start to pulse food processor; slowly add olive oil until you get the consistency you want; add about a 1/4 cup of parmesan cheese and blend together. You can add pine nuts to the recipe, but I left them out as I am planning to share the pesto with a friend who can not eat nuts. 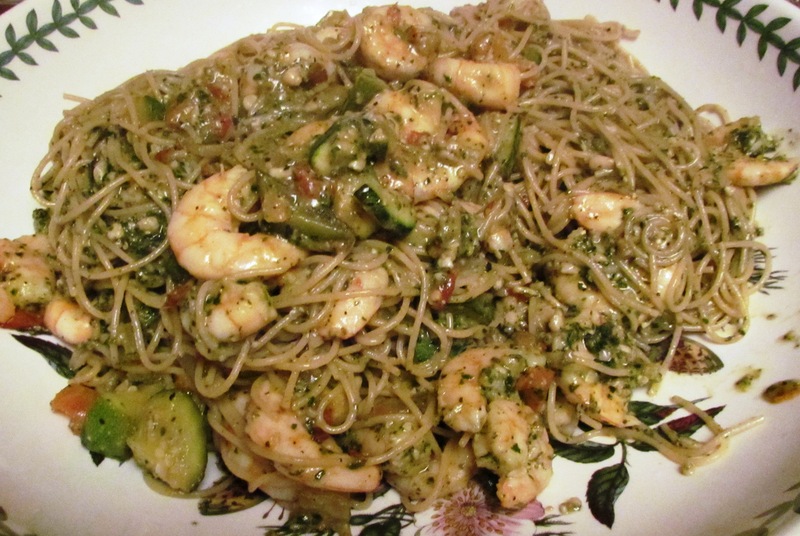 I served this over some linguini – very tasty and the asparagus is a nice vibrant summer green! Black Rice?? Yes – my new favorite thing! 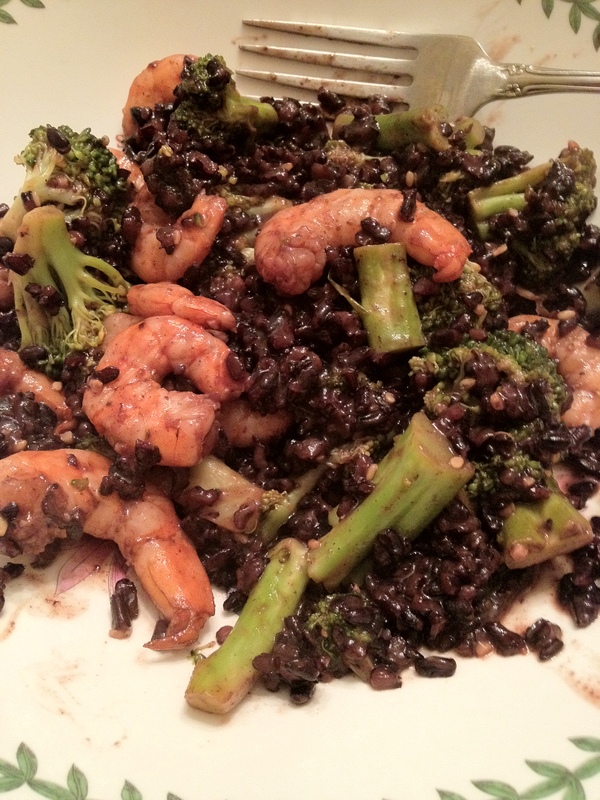 In a pan – stir fry broccoli until almost done – add shrimp and sauce when shrimp is done, toss in cooked black rice and heat – serve immediately – it is WAY yummy. This is such an easy recipe and a real crowd-pleaser. Chop vegetables into bite sized pieces. I used zucchini, tomatoes, and onion. Preheat oven to 375 – and start a pot of water to boil for pasta. Put vegetables on a cookie sheet with garlic and olive oil. Roast vegetables for about twenty minutes. Add shrimp and feta or blue cheese and return to oven until the shrimp are done. Toss over pasta. I also added pesto to this and it was delicious. More fun with figs. This was a tasty one. Pre-heat oven to 325. Spray non-stick spray on a casserole dish and add chicken breasts and start them cooking. 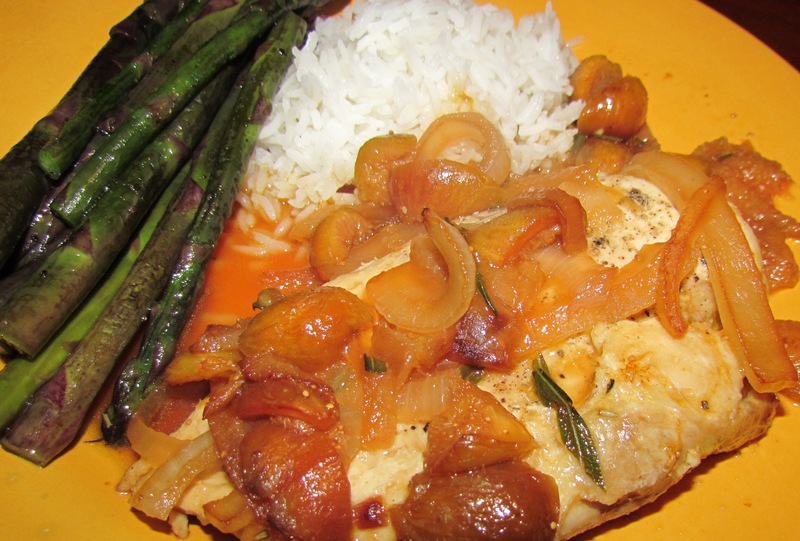 Put onions in a saute pan with a tablespoon of butter and cook until lightly browned. 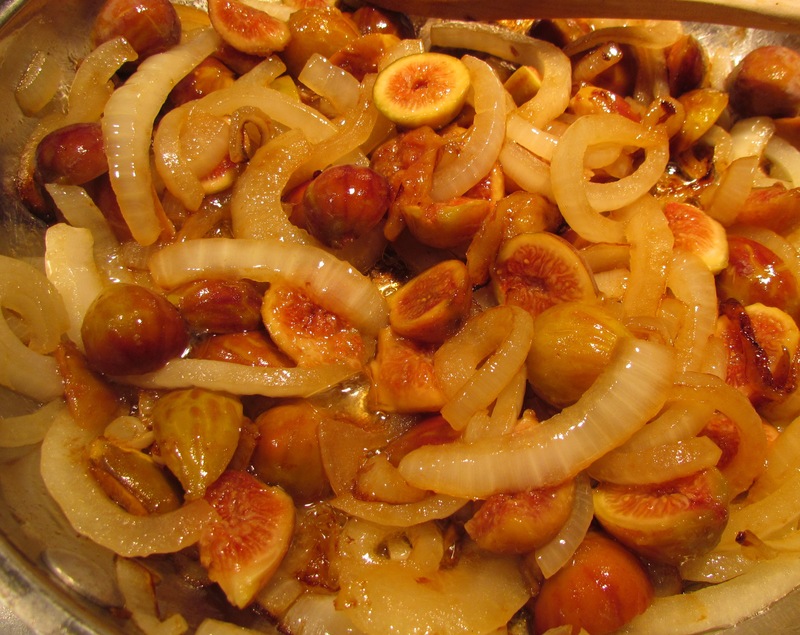 Add figs, rosemary, broth, and wine. Let the sauces simmer until it thickens a bit. Add sauce to the chicken and continue cooking until the chicken is done. I served it rice and with some fresh asparagus. This tasted so much better than the picture looks. I haven’t quite figured out the macro setting on this camera 😦 Regardless – this was a yummy vegetarian dinner. I marinated the Portobello mushroom in soy, ginger and garlic for about 45 minutes. The roasted red peppers I made ahead of time. Pre heat oven to 400 degrees, slice pepper in half and de-seed. Sprinkle with olive oil and cook until skin begins to blister. Remove from oven and put in a bowl and cover with plastic wrap. When pepper has cooled remove skin. 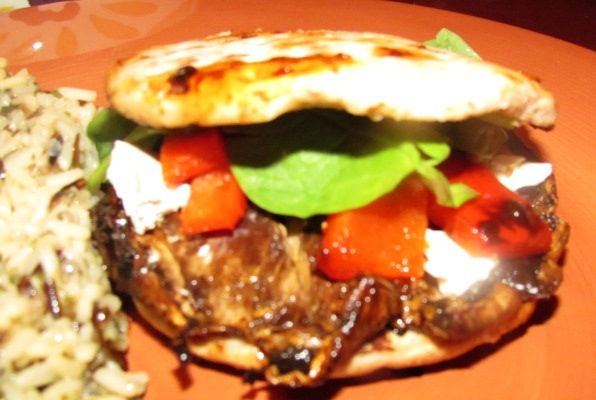 Heat Grill and cook Portobello until warmed through (about 10 minutes) serve with roasted red peppers (sliced) goat cheese and top with spinach. I put mine in a whole wheat sandwich round and served alongside wild rice and a side salad. Definitely a good summer dish and a nice alternative to meat. I will do this throughout the summer I am sure – you could do the peppers on the grill for that matter – just depends on how much time you want to spend outside. Its been unseasonably hot here so far this year so I opted for the cooler indoor temps and only grilled the mushroom. I think the next time I do this I will top with basil and see how that changes the flavors up a bit. A member of my book club made this for book club the other night and I had to try it. I made some changes to the recipe she used as I thought I might like it a bit spicier. It is also pretty unusual for me to make something with so many canned goods, but having tasted it, I knew I could make it work. 3 whole skinless, boneless chicken breasts. Place all ingredients except the chicken in a crock pot on low heat. Stir ingredients to mix in the taco seasoning well. 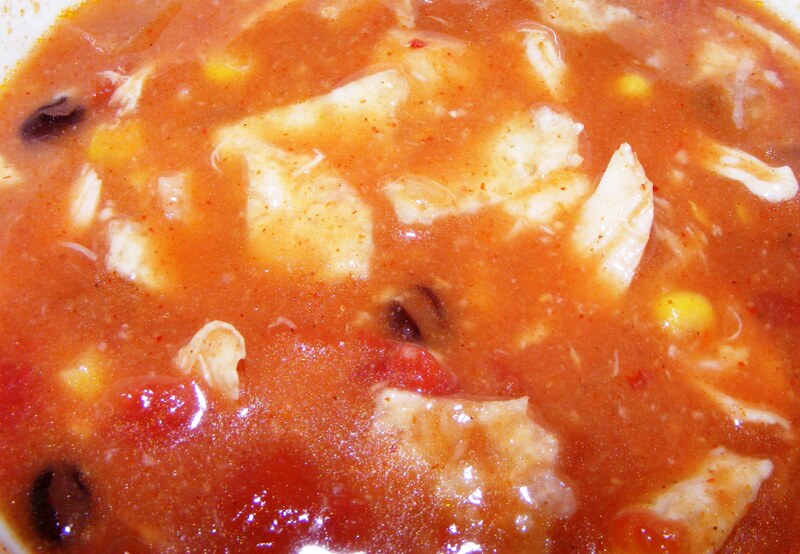 Place the chicken on top of the soup and press down just enough to lightly cover the chicken. Cover and cook for five hours. Remove chicken from soup and shred. Return shredded chicken to the pot and cook for 2 more hours. Serve with shredded cheese and tortilla chips – you could also top with sour cream if desired. The soup turned out well. You could certainly speed the process by cooking this on the stove top and poaching the chicken in broth, and then shredding it and throwing it in the pot. Either way, it is a good meal on a cold day and we have had our fair share of those as of late here in Savannah. I found the base for this recipe on allrecipes.com.